Quimperlé is a town in southern Brittany between Lorient and Concarneau and at the eastern edge of the Finistere department. Quite a small town, it is based around the Ellé river and the Isole river where they converge to create the Laita river. The combination of riverside setting, a medieval centre and the abbey make Quimperlé an attractive and popular destination for visitors. 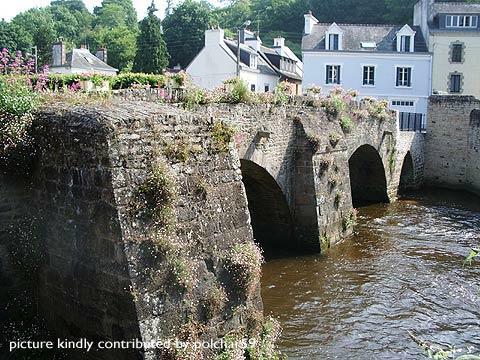 Quimperlé is a magnet for tourists due to its very pretty centre, with streets containing some medieval half-timbered houses typical of the Brittany region, along with some more grand houses once owned by nobles of the town. Start your visit with a stroll along the Quai Brizeux before heading off to explore the town and abbey. The best example of medieval houses in Quimperlé is perhaps the lovely 'Maison des Archers' on Rue Dom Morice. 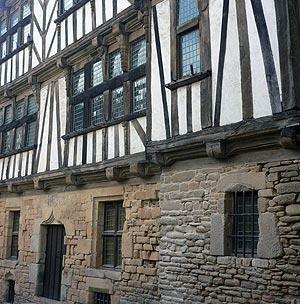 The house, built around 1550, has a half-timbered facade on three levels and holds occasional art exhibitions. The house next door is said to be the oldest in the town. There are also some interesting churches to be discovered in the town, including Sainte-Croix abbey church in the heart of the old (lower) town and the gothic style church of the Notre-Dame-de-l'Assomption (13th - 15th century) in the upper town. The Abbey Sainte-Croix is the principal historic monument in Quimperlé. 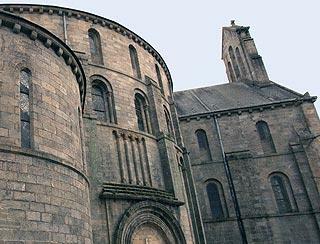 The abbey dates in part from the 11th century and is very unusual in having a circular design. Note that the church suffered a major collapse in the 19th century, including its belltower, so much of what we see today dates from the late 19th century. The original crypt and some or the original roman style church can still be seen. Inside the abbey church there are some very interesting highlights including the beautifully detailed 16th century altarpiece and a statue representing Christ being placed in a tomb (a 'mise au tombeau'), both dating from the 16th century (note that the figures in the mise a tombeau were originally painted, but this was washed away when the statue spent many years neglected outside. To the rear of the Church of Sainte-Croix in the Rue Bremond-d'Ars you can also see the ruins of the Church of Saint-Colomban, while to the front there is an unusual 19th century market hall in wrought iron and brick that looks to have been inspired by the Eiffel tower erected earlier in Paris. 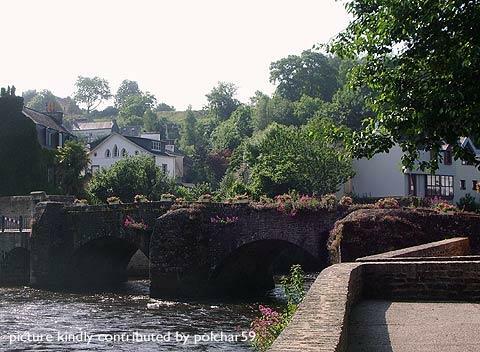 Also close by, the old stone bridge called the Pont Fleuri in the town lives up to its name and is bedecked with flowers all through the summer, and in a very picturesque setting. 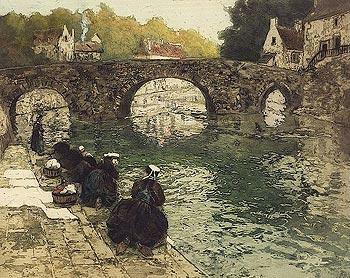 See how things change - the photo shows a picture of the bridge and river by 19th century artist Fritz Thaulow, with washerwomen washing their laundry where tourists now picnic. The baroque style Ursulines Chapel in Quimperle is now used for displaying occasional contemporary art exhibitions - remember to look up at the beautifully decorated ceiling! As you explore the town centre you cross the rivers in several different places and it is the views along these rivers that provides a large part of the charm of Quimperlé. Various activities are also available on the rivers near Quimperlé, in particular canoeing and kayaks. 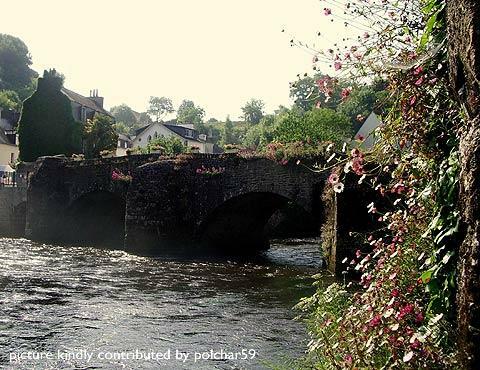 The choice of rivers means that there are lovely tranquil stretches of rivers suitable for all the family to enjoy peacefully together and other stretches which are well known for the challenges they present to expert canoeists - in fact competitions are often held here on the river at Quimperlé.